Festive drinkers will be able to keep track of their alcohol habits through an interactive mobile phone application. The Department of Health's downloadable tracker allows drinkers to get a personalised chart of their consumption to see if they are drinking too much. Excess drinking has been linked to a range of health problems and disease. The alcohol tracker will be available free across the UK, although users will need internet access on their phones. 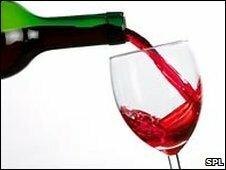 Public health minister Gillian Merron said: "It is all too easy to lose track of how much you drink. So as the festive parties build up, this innovative tool will help people keep tabs on their drinking - wherever they are. "Sticking within the recommended limits means you reduce the risk of serious conditions such as mouth cancer and strokes." The application, which can be downloaded from the NHS Choices website www.nhs.uk for Windows phones or from iTunes, requires drinkers to enter the number of drinks they consume each day. It will then provide personalised graphs tracking drinking habits and make it clear by how much a person should cut down. For people without either of these two phones, there is text service available which will give advice about how much people are advised to drink. To access this text unit to 64746. It is part of the government's £9m Know Your Limits marketing campaign to encourage safer drinking. Current guidelines suggest men should not regularly drink more than three to four units a day and women not consume more than two to three units. The mobile phone tracking has been given the backing of Drinkaware, the charity which promotes responsible drinking. Chief executive Chris Sorek said: "Efforts to help people keep track of how much they're drinking over the festive season and throughout the year are a good idea." He added avoiding excess drinking would help people avoid the "January slump" as well as helping them keep healthy.